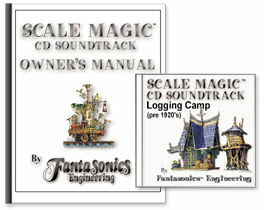 This CD soundtrack will create the ambiance for most any early logging camp, especially those with a bunk car or two. In the background, distant loggers are busy felling trees with axes and two-man-saws, and a donkey boiler and engine are working the winches. In the foreground, the camp crew is often 'quietly' at work on machinery and such. The entire scene is set in a Scale Magic mountain forest ambiance. Includes both day and nighttime scratch built tracks, but you might hear a lumberjack snoring away ("sawing logs")... anytime.